Five o’clock Thursday. Peak domesticity. The washing machine was swirling. The dishwasher was whirring. The sausage rolls for Friday’s lunch boxes were half-cooked. The shower was running, the heat was heating, the lights were on. Until suddenly, mid spelling-test-prep, they weren’t. The house was in darkness. Myself and the spelling-test-prepper looked at each other, then she ran to the door to check if our neighbours had power – they did. The small boy asked if we could go outside, to stand under street lights, because he doesn’t like the dark. I said not to worry, I’d have everything fixed in a jiffy. With the confidence of one who’s been there before, I grabbed my phone, switched on my torch app (yay technology) and climbed up to the fuse box to see which switch had flipped. But the switches were all sitting innocently at “on” and as I clicked them ineffectively up and down, my confidence in my electricity-fixing skills swiftly flicked to “off”. “What are we going to do?” asked the kids, worried now, as they’d just realised the TV wouldn’t work. “No problem!” I said brightly, “I’d say it’s the main fuse. I’ll just, um, twiddle it a bit.” The twiddling was unsurprisingly futile, I needed a plan B. 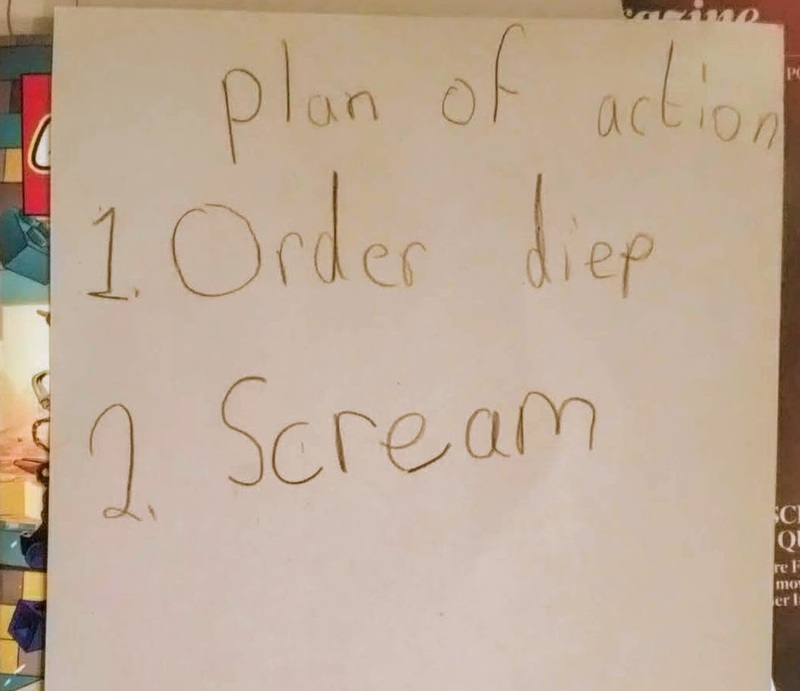 Plan B usually involves messaging my husband so he can take over the switch-flicking and figuring-out, but he was in the UK for work, so it was on to Plan C. Just as soon as I figured out what Plan C was. Then I remembered our neighbour is an electrician (handy for everyone else, maybe less so for him) and ran down to call at his door. He wasn’t there but I got his number and called him. He said he’d swing by in a few hours, and relieved, I went home to tell the kids the good news. What to do in the meantime, they wondered? I told them they could sit and chat, and it would be fun to take a break from everything and pretend we’re in the olden days. I put on a reasonably good show of cheerfulness I reckon, but in reality I wasn’t convinced – pretending it’s the olden days is all very well if you know the power is definitely coming back and you’ve had dinner already and it’s not a school night and your husband isn’t away and your phone isn’t down to 20% power. In the meantime, the house was getting cold with no heating on, and it was pitch dark. 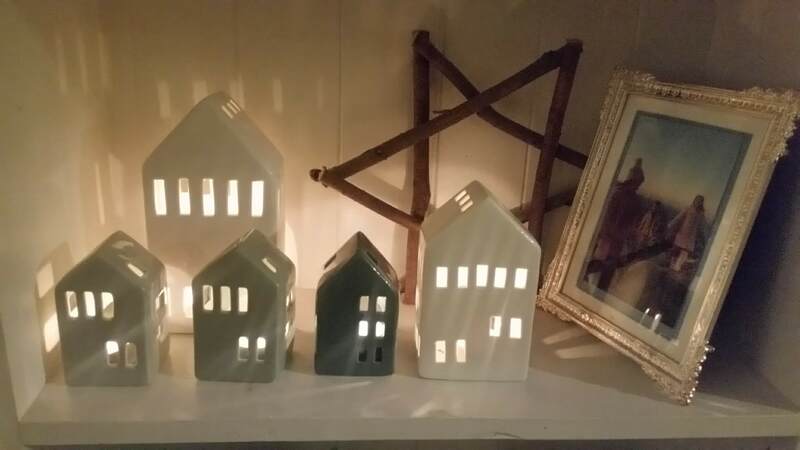 I lit 43 tea-lights, thinking wistfully back to the lovely thick candles I’d seen in Sostren Grene the week before, but left on the shelf in a fit of stop-buying-things-you-don’t-actually-need-ness. That’ll teach me. I searched for the torch I bought during Storm Ophelia but to no avail – I know I put it somewhere safe so I’d easily find it in a power cut, I’m just not sure where. 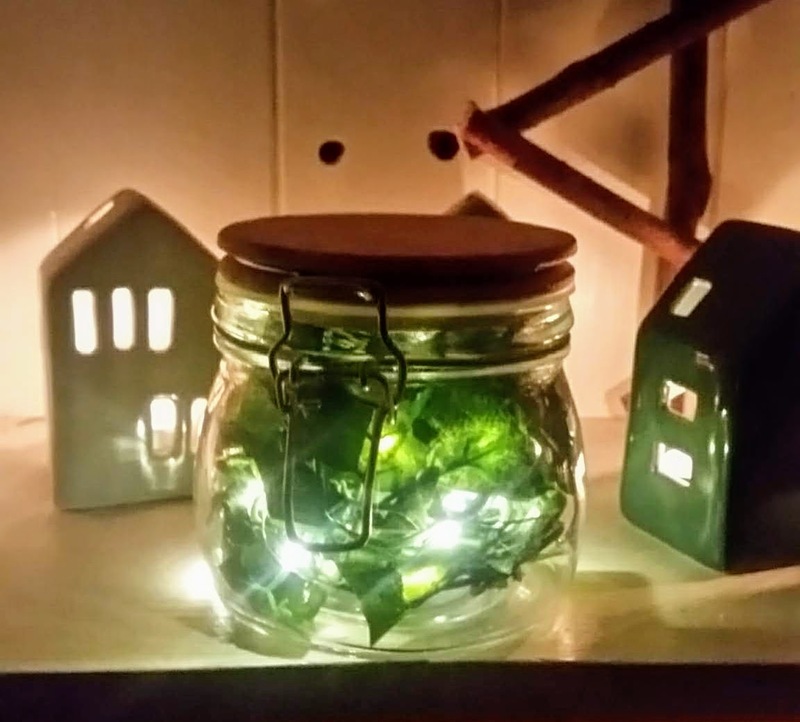 Then my eldest remembered the glass jars – the ones we’d filled with fake foliage and LED fairy lights during the summer, and they became our lamps for any necessary journeys outside our siting-room bunker. “We’re starving,” the kids told me a six o’clock, so I took a glass-jar-lamp and got three bags of popcorn. Being allowed eat popcorn in the sitting room AND before dinner turned out to be a big hit in the novelty stakes and kept everyone happy for the next twenty minutes. Meanwhile, I was looking at my dwindling phone battery – 14% and falling. The broadband wasn’t working so my phone was operating on 4G – how long would that last, I wondered, checking my call credit. €1.75 left. Hmmm. Being stranded with three children and zero husbands and no phone in a power cut didn’t seem ideal. So McGuyver-like, I used the mobile hotspot on my phone to connect my laptop to the internet, and topped up my phone on my laptop (yay technology) then used the torch on my phone to find an unused power bank to save my battery from the cliff edge on which it was teetering (again, yay technology). Hint taken. I gave in at about seven o’clock, and ordered a takeaway (online – yay technology). The kids, apart from asking every ten minutes when the electrician was coming, threw themselves into the situation with what can only be described as gusto. They did an improvised candlelight ballet display (none of them actually do ballet), planned Christmas, and did a puppet show. They played Charades, Two Truths One Lie, and a game that involved telling everyone the biggest secret you’ve never told anyone but you can’t get in trouble for it. (Hmmm.) And when the electrician turned up at eight o’clock, they were delighted to hear that the temporary fuse meant we had lights, heat, and TV, but no cooking – the Diep was not in jeopardy. As they went up to bed that night, taking care to switch off lights and not overload the precious too-small temporary fuse, they were in high spirits. “That was so much fun, I hope we do Our News tomorrow so I can tell my teacher,” said the smallest. Me too. “I loved tonight,” said the eldest, “it was a really good bonding time, wasn’t it Mum?” In fact, surprisingly, me too. “Hey – did you do it on purpose to teach us the value of life without technology?” asked the middlest. “Will we do it again soon?” Not for all the tea (lights) in China. Next Next post: What is Imposter Syndrome and how do you shush that voice?